Google’s Eric Schmidt has said Mountain View will keep its two OSes, Android and Chrome, separate after all, according to a Reuters report. 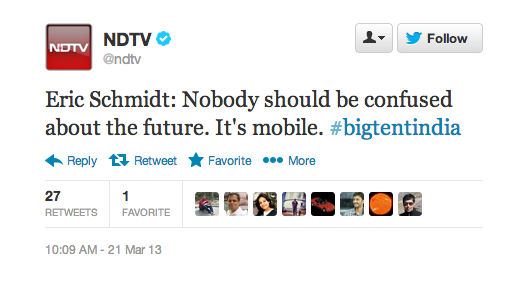 Schmidt, who is in India attending an IT event called Big Tent Activate Summit, said the two operating systems will remain separate products but apparently also said there could be more “commonality” between them. TechCrunch contacted Google and asked it to confirm whether it plans to keep Chrome and Android separate but Google declined to comment. What’s most interesting about Schmidt’s comments today is that his words, as reported, seem to contradict comments he made back in February 2011, when he told delegates at the Mobile World Congress tradeshow that Chrome and Android would absolutely converge. 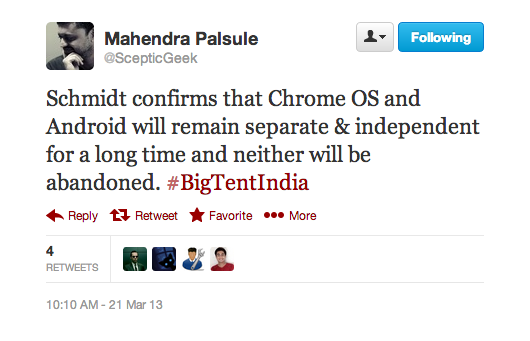 In other words: a Chrome-Android merger is inevitable, but also won’t be rushed. So his comments today — about increasing commonality between Chrome and Android — suggest Google is still building a gradual path towards convergence (as Schmidt said it was in 2011). Rumours that Google’s quasi-desktop OS Chrome and its touch-based mobile OS Android might be about to merge were sparked earlier this month when head of Android, Andy Rubin, was shuffled out to another role within Google — with Sundar Pichai, head of Chrome and apps, taking over. Pichai did not leave his existing duties but rather added the Android brief to his Chrome and apps portfolio, suggesting a unifying impetus for the job changes. Make no mistake though: the ultimate merger of Chrome and Android is inevitably since the differences between hardware categories are being eroded. Chrome OS was announced in mid 2009 — at a time when netbooks were riding high. Remember them? The launch of the iPad in 2010 created the tablet category afresh and tablets quickly pulled the rug out from under mini laptops, and started eroding the desktop computing market too — putting the emphasis squarely on touch and mobile computing. And from there it’s but a short hop to gestures and wearables. All of which underlines that ultimately having two separate OSes — one mobile and one quasi-mobile — makes no sense for Google in the long run. It’s not a question of if Chrome and Android will merge — the big question is how soon it can be made to happen.